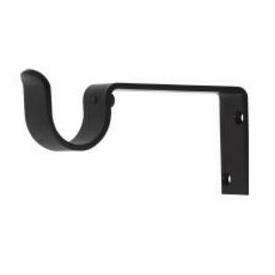 5 inch projection bracket for 1 1/2" diameter curtain pole -- BasicQ Inc.
5 inch projection wall mount bracket for 1 1/2 inch diameter indoor or outdoor curtain rod. Includes hidden lock screw to hold rod. Available in two colors in stock, ready to ship. It can be used indoor or outdoor. Use on those windows that face patio or pool area, or use inside on any window. Charleston collection by Design Elements. Finish: Powder coated Material: Metal Use indoor and outdoor 5 inch projection, 5 3/4 inch return Size: 3 inches high by 7 inches deep Priced and sold each.